John McCabe is well-known both as a composer and a pianist, and though he was slow to add piano music to his worklist, in recent decades he has written a great deal of keyboard music. 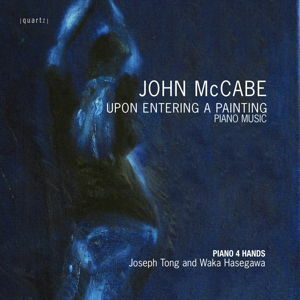 Quartz has released a CD of McCabe's music for piano duo, performed by Joseph Tong and Waka Hasegawa (Piano4Hands). The CD has been given the title of the first work, Upon Entering a Painting, for piano duo. The work was prompted by McCabe's response to an exhibition of paintings by Mark Rothko, and especially by his reaction to the surface tension of Rothko's brushstrokes. Other works on the CD are Two Scenes from Edward II: The French Court/The Barons, for two pianos, and Basse Danse, for two pianos. Finally come two solo piano works: Gaudí (Study No 3) performed by Waka Hasegawa, and Sonata (Study No 12 - Homage to Tippett), performed by Joseph Tong. The CD, which has attracted extensive excellent reviews, including in the US, is on Quartz QTZ 2088. "Upon Entering a Painting (2009), was commissioned by the present performers and was inspired by the Rothko exhibition at the Tate Modern in 2009. McCabe tells the story of how he was inspecting the canvases at short range to really appreciate the surface detail, and how this incurred the wrath of the curators. The result was clearly worth it. He describes the sense of approaching a painting physically in the music by aggregating textures. Faster sections reflect the “teeming inner life of the brush-strokes"; the closing stripping of textures represents physical distancing from the painting (and is superbly managed here by the players). The players are brilliant, bringing tremendous vitality to the dancing sections; fast runs are jaw-droppingly articulated. "The 1970 Gaudí, formally a rondo, is dedicated to Valerie Tryon and is composed in tribute to Spanish architect Antoni Gaudí. McCabe uses bell and gong gestures to register his reactions to Gaudí, as well as delicate filigree (gorgeously rendered here) and evocations of an idyll. This is a lovely, fascinating work in which the generating factor ... results in a finely constructed stand-alone piece. Hasegawa, on her own here, clearly enjoys the sonorous variety on show. Finally, the Sonata (Study No. 12), a tribute to Tippett ... Tong is the featured pianist here, and he gives a performance of utmost concentration and delicacy. "A memorable disc. Let's have more of McCabe’s music in the catalogs." "In his introduction to this lively programme, he admits that it took him years to feel comfortable about writing piano music. "But that reflection is unnecessarily modest, given the flair, imagination and sonic fireworks on display in these pieces dating from between 1970 and 2009. His idiom often strikes a balance between confrontational dissonance, engaging propulsion, and references that are well-informed and cleverly applied. "Upon Entering a Painting is inspired by Mark Rothko and seeks to evoke, through musical structure and pace, the way that art draws the observer inside its frame. It's dedicated to Tong and Hasegawa, and, like all the performances here, shows them to be sympathetic, scintillating interpreters." "[Upon Entering a Painting] is a very important work, not merely in McCabe's output but in the duet repert­oire and is superbly played by the dedicatees. They are equally impressive in the two 2-piano pieces from McCabe's brilliant (orchestral) ballet 'Edward II' ... But more serious items, and equally splendidly played, are the two solo Studies - 'Gaudi' and the more recent Sonata (sic) of 2009, subtitled 'Homage to Tippett'. In this final work, Imp­ressionism has no overt place in McCabe's invention, and we can experience this superb composer's thought-processes more freely - perhaps. What cannot be denied is the excell­ence of the playing on this disc from both musicians; they make a splendid partnership and as individual artists they are beyond reproach. "These excellent performance will do much to enhance McCabe’s reputation as one of our most distinguished composers." "[Upon Entering a Painting] is one of the composer's most life-affirming works. Nowhere is his mastery of the art of touching the keyboard more vividly apparent. The piano's basic functions as a percussive and sustaining instru­ment are rigorously - and joyfully - explored in textures which are by turns chordal, filigree, ornamental, heavily accented and toccata-like. McCabe's bold eclecticism, no doubt informed by his breadth of repertoire as an executant, is also heard to great advantage in episodes that embrace primitive minimalism, impressionistic mysticism and classical poise. Liberal helpings of wit are dis­played as motifs are distorted, inverted and passed between the players, serving to hoodwink the lis­tener at every turn; a delightfully manic sequence of scrunchily dissonant chord clusters is a particu­larly felicitous invention. [It] gets the disc off to a splendid start, especially when showcased in an ideal performance that success­fully combines expert precision and emotional engagement. "Joseph Tong points up the [Sonata's] structural cogency without neglecting its consid­erable lyrical poetry, often inhabiting the piano's highest register. "Sympathetically recorded in clear sound, these performances are both spirited and sensitive." Produced, Engineered and Mastered by Andrew Mellor at AJM Productions Ltd.